At our request, after the Fukushima accident, our manufacturing partner developed kitchen filters optimized to remove all the types of radiated contaminants, using industry-proven media. They combine 5 types of filter media, each which selects for one type of radiated contaminant. 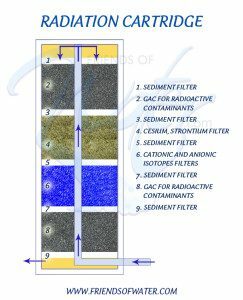 The filters work on radiated iodine, cesium, strontium, plutonium, uranium and other radiated contaminants. The materials combined in this cartridge use only materials proven over many years to effectively removed radiated materials. These are each separated by a sediment filter. These have primarily in the past been used in industrial settings. Here they are combined into what we believe is the most effective radiation protection you can get in a 10 inch cartridge. Should you wish to increase protection, you can put 2 or even 3 of these cartridges in line in one of our undercounter or countertop 2 or 3 canister kitchen filters. Carbon particularly works on radiated iodine. There are carbon beds to start and finish the cartridge. The second bed is resin which selects for Cesium and Strontium. This uses ion exchange. Scientists have long used activated carbon to remove Iodine-131 from the liquid fuel for nuclear solution reactors. Activated carbon works by adsorbing contaminants, and fixing them, as water passes over and through it. It can eventually reach load capacity and cease to adsorb new contaminants. So change radiation cartridges once a year, or if radiation has spiked in your area, more often. The EPA recommends ion exchange for removing radioactive compounds from drinking water. Ion exchange removes contaminants when water passes through resins. Those resins readily exchange ions with contaminants, rendering the radioactive material inert. These cartridges include a combination of resins that work on different radiated compounds. We all love to know how much of anything is filtered out. Unfortunately, there are too many variable to state specific percentages. It will depend upon the overall level of radiation, the chemical mix and the comparative levels. As the chemist who put these together said: “Capacities are chemistry driven.” What these cartridges are is the best combination of materials known to be extremely effective against radiation contamination available. Between them, the media work on all radiated compounds found in water. What you can and we should do is get as much of the right filter material working for you as you can. More of the right filter materials means a higher level of protection. What some customers are doing is keeping one or more radiation filters on hand, to put into their kitchen filters (they fit all we sell) in the event of emergency. Fluoride and chloramine and others such things found in the water can cause health risks over time. Radiation can peak and decrease more quickly. We have seen other kitchen radiation filters that will do a lot of good. However, this is the only one we’ve seen that has the materials needed to filter both positively- and negatively-charged radioactive particles.